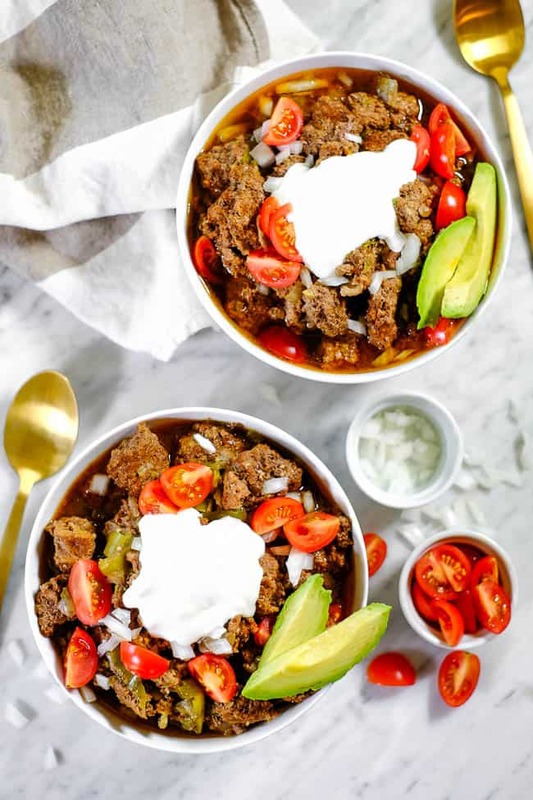 This no bean Whole30 Keto Chili is filled with rich, meaty flavor! 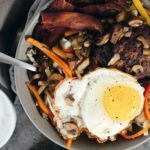 It’s an easy meal to throw together and you can use either the slow cooker or instant pot to do all the work. 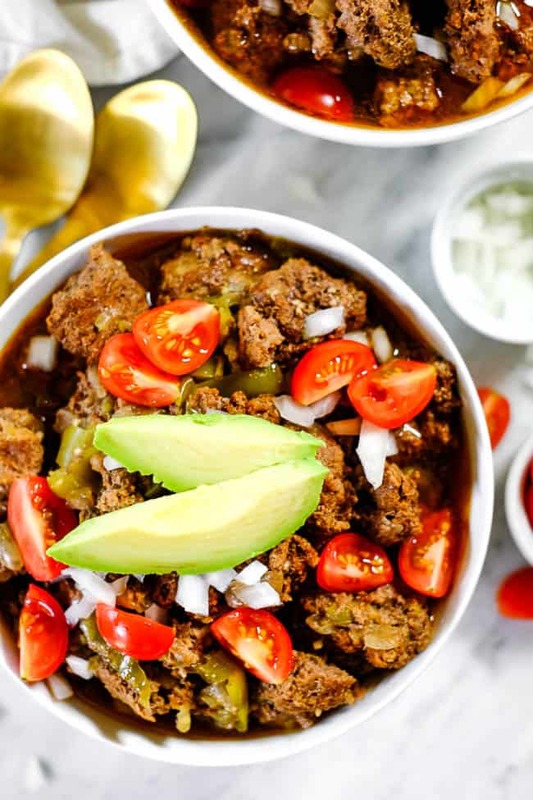 With only 6 main ingredients plus some seasonings, this is such a quick weeknight meal and a hearty chili option that’s also low-carb! 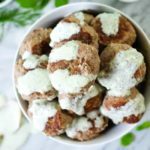 If you have been following along with our recipes lately, you might have noticed that we’ve published some recipes tagged as “Keto”. 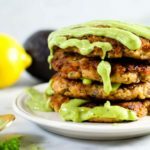 While we are not totally following a Ketogenic diet ourselves, we recognize that the number of people following the diet has grown significantly and there is some overlap with Paleo, Whole30 and Keto recipes (sometimes). Personally (Justin here), I’ve found that a lower carb/higher fat diet seems to be one of the best ways to eat for me. I feel good, have sustainable energy, have less snack cravings and less bloating eating this kind of diet. While I personally don’t count carbs and macros, eating a mostly Paleo diet with a focus on lower carb intake and higher fat intake seems to be a good general template to follow for my body. I can’t actually take full credit for this recipe. It’s loosely based on a recipe my Mom made a while back when I was visiting. 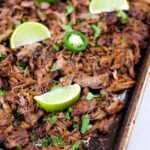 Although her version had beans, it had this smoky flavor and was packed with meaty goodness. I just had to try and make a similar version. 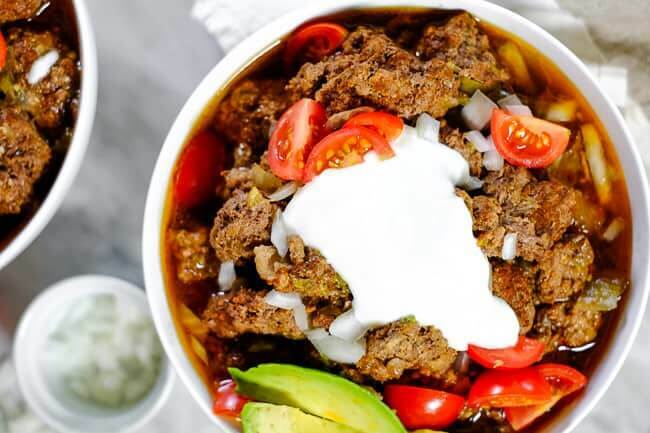 Using some basic seasonings and getting an extra smoky kick from liquid smoke, this keto chili uses ground beef, stew meat and some onion and bell pepper. Keep it simple folks! 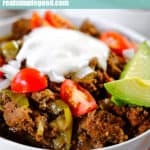 Although the flavor is a little different than Mom’s version, I’m pretty happy with how this keto chili recipe turned out. 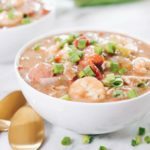 It’s super easy to make because you just throw everything in the slow cooker or Instant pot and let it do its thing. Then, just layer on your favorite toppings and you are set to dig-in! We added some diced onion, tomato, avocado and plain coconut yogurt. If you eat dairy, feel free to add on some cheese and/or sour cream. 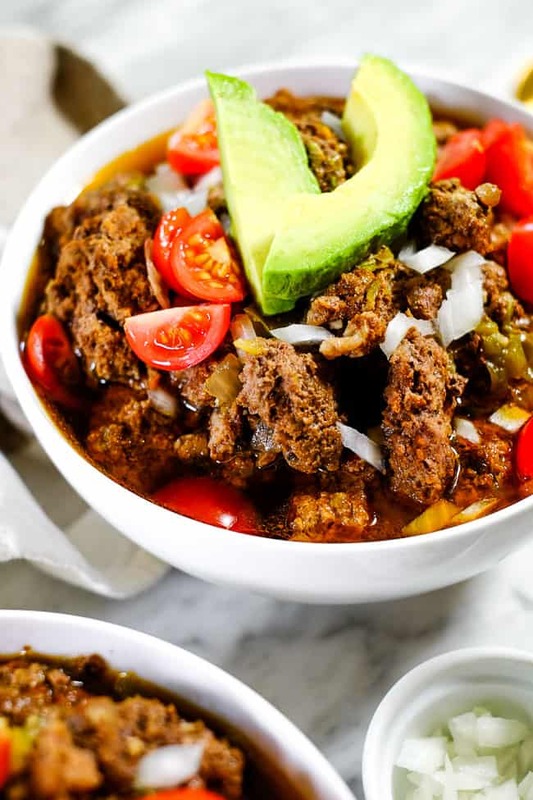 Even if you aren’t following a keto or low-carb diet, this keto chili is filling and delicious! 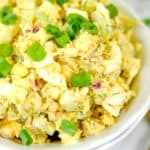 You’ll enjoy how quick and easy it is to put together and topping it with whatever you want! 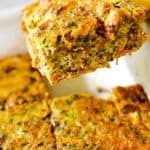 Leave a comment below and let us know how it goes if you make this recipe. Also, take a pic to share on Instagram! We love seeing what you guys make! Tag us @realsimplegood, and give us a follow if you don’t already! 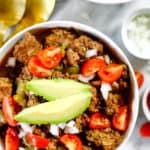 This no bean Whole30 Keto Chili is filled with rich, meaty flavor! 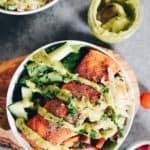 It's an easy meal to throw together in either the slow cooker or instant pot. Prep onion, bell pepper and garlic as noted. Place ground beef and stew meat in the instant pot and break the ground beef up into small pieces with a spoon. Season the meat with the chili powder, smoked paprika, chipotle powder, salt and pepper. Pour in the liquid smoke. Stir the beef to mix in the seasonings. Pour in the beef broth and add in the onion, bell pepper and garlic. Place the lid on the instant pot and close the pressure valve. Press the "soup" button. Allow the cooking cycle to complete and then quick release the pressure. Open the lid when safe to do so. You may need to break up the beef into smaller pieces at this point if needed. Taste soup and season with additional salt and pepper as desired. Spoon into bowls, top with desired toppings and enjoy. Follow steps 1-3 above, placing the ingredients in and mixing in your slow cooker. Secure the lid on the slow cooker and cook on low for 8-10 hours or on high for 5-6 hours. You may need to break up the beef into smaller pieces at this point if needed. Taste soup and season with additional salt and pepper as desired. Spoon into bowls, top with desired toppings and enjoy. 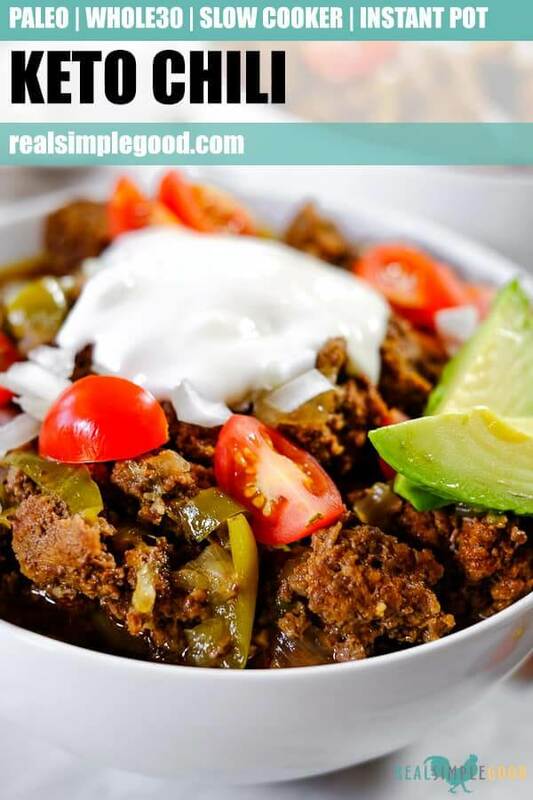 delicious chili, made it with ground turkey!!! !